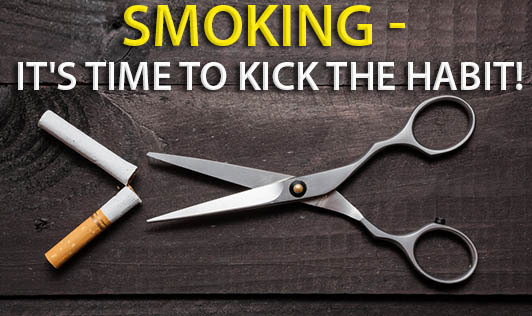 Smoking - It's Time to Kick the Habit! Nicotine addiction is harmful and smoking cessation involves a lot of hard work and willpower for most people. Smoking tobacco is a physical addiction as well as a psychological habit and, that's why most people find it tough to quit smoking since one will experience physical withdrawal symptoms. But the good news is that you can quit smoking successfully with the right game plan that is tailored to your needs, by replacing your smoking habits and managing cravings. You can start by telling yourself that each day you don't smoke, you have made a small victory for yourself. And, this will eventually add up to a huge victory over time. Start your stop smoking with a "START". T= Tell the people who matter to you that you are planning to quit smoking. A= Anticipate and plan for the challenges that you will face while quitting. R= Remove cigarettes and any other tobacco products from your home, car, office. T= Talk to your doctor about getting help to quit smoking successfully. It's important that you also list the reasons as to why you want to quit such as "I will have more energy, whiter teeth, and feel healthier, minimize the risks for cancer, early death, skin wrinkling and strokes" Keep copies of the list in places where you would normally keep your cigarettes. This personal game plan tailored to your specific needs can be of great help! - During the first few days after you have quit smoking, make it a point to spend time in public places where smoking is not allowed such as libraries, malls, theatres. - Drink plenty of water, eat well and get enough rest. - Don't drink alcohol, coffee or drinks which you link with smoking for a few months. Instead, have juices, and choose drinks that are calorie free or low in them. - If you miss the feeling of holding a cigarette, hold a pen or a coin. In the same way, find an oral substitute if you miss having something in your mouth. Try sugarless gum or cinnamon sticks. - Stay away from people or places you link with smoking. - Create a non-smoking environment around you. - Keep your goal in mind and the urge to smoke will get weaker over time. - Eat 4 to 6 small meals instead of 1 or 2 large ones during the day. - Avoid sugary and spicy food that may trigger an urge to smoke. - Remember that anger, frustration, irritability and depression are quite normal after quitting and will get better as you learn to cope. Consult with a doctor if these feelings last for more than a month. - Exercise. This will improve your mood and relieve stress. - By no means allow yourself to think that just "one cigarette won't hurt", because it very likely will. - Get support that you can count on. What to do if you relapse? There are people who try to quit smoking several times before they kick the habit. Identifying triggers you ran into when you tried to quit will help you learn from your mistakes. - Remember you're not a failure if you have had a small setback and it doesn't mean that you can't quit for good. - Look back on the methods and ways which helped you reduce smoking and feel good about the times when you went without smoking. - Locate the trigger and find out what exactly made you smoke again and decide on how you would want to cope with that issue in the future. - It's important you learn from your experiences. Understand what didn't work when you tried to quit and what has been most helpful. - Have you used any medicine in the past to help you quit? Consult with your doctor if you start smoking again since some medicines cannot be used simultaneously. "The process of quitting smoking doesn't end with the last cigarette. It's not quitting itself; the real key is staying quit"!